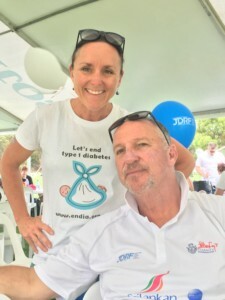 JDRF Australia has organised their annual ‘One Walks’ across the country between October and early December. On Thursday 30th November, it was Adelaide’s turn! The ENDIA Project Management Team were delighted to meet some of our participating ENDIA families as well as a number of celebrities! Sir Ian “Beefy” Botham was the celebrity attending the JDRF One walks this year. He is very invested in type 1 diabetes advocacy and research as his daughter, Becky, lives with type 1 diabetes. He is a grandfather now, and is very interested in preventative research such as ENDIA. Thanks to Sir Ian (former English first-class cricketer) and surprise celebrity to Adelaide, David Koch (Kochie; Sunrise Presenter), for taking the time to learn about the ENDIA Study and supporting our endeavours to find the causes of type 1 diabetes. Sir Ian Botham agreed with Engagement Coordinator, Kelly McGorm, that we need to find the causes of type 1 diabetes to then prevent it. 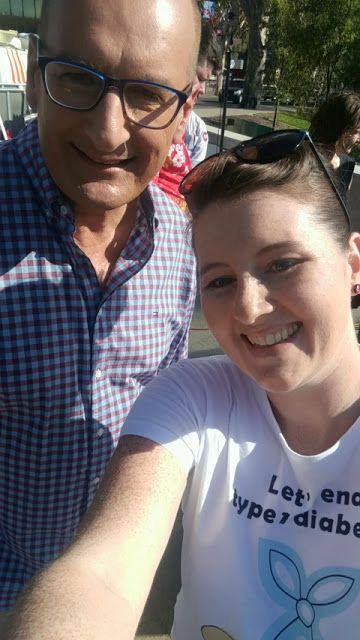 Kochie heard about ENDIA out front the Adelaide Oval from our Project Manager, Megan Penno. He supports the study all the way!